How do I use my 32 bit Photoshop Filters with ArtRage 4.5? If you have 32 Bit Photoshop filters that are 32 bit, then these won’t run in 64 bit ArtRage 4.5. However, both OS X and Windows versions have the ability to run in 32 bit mode if they need it. On OS X, select the application icon and choose Get Info from the Finder’s File menu, then turn on the 32-bit Mode toggle in the info panel and the app will launch in 32 bit mode. 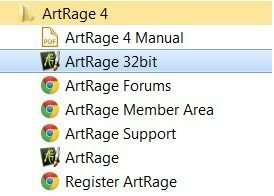 On a Windows 64 bit system we install 2 files: ArtRage.exe which is 64 bit, and ArtRage32.exe which is 32 bit. Link to this item: How do I use my 32 bit Photoshop Filters with ArtRage 4.5?